A new product called Belty was unveiled by Paris-based startup Emiota at CES on Sunday. It is a smart belt which self-adjusts itself automatically depending on changes in your waistline throughout your day, whether that change is due to overeating or simply just sitting down. 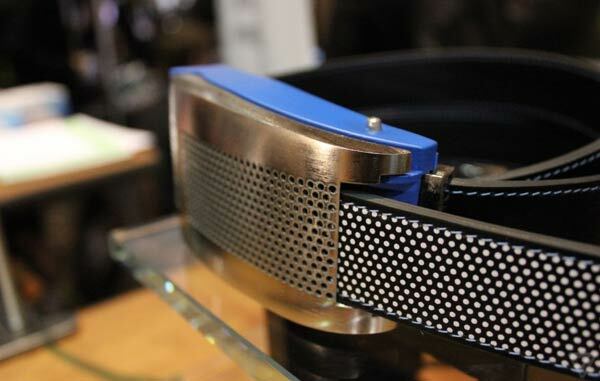 This, the world’s first smart belt will prevent conditions such as pant droppings or ‘builders bum’ and can relieve you from the tight feeling just after a big feed as the electric-powered motor built into the buckle expands and retracts based on waist size. Its main feature also means that the Belty is something that could be kept and used over the years, regardless how much you let yourself go. While the prototype’s appearance might be ugly to some – it is a device with some practical health tech use. The device is said to help track lesser known fitness and health features such as daily changes to your waist as you go about your day with the small sensors, accelerator and gyroscope that comes with the belt. It tracks the wearer’s activity when it’s worn and charts the data via an accompanying app which connects to the Belty wirelessly, and reminds you with feedback and suggestions in real time, based on how the belt adjusts, in situations like when you have been sitting for too long. Users can also teach the wearable their preferred level of tightness, in addition to specifying the limits of how far the buckle can winch itself in, so it doesn’t accidently do any damage and cut off your circulation from the waist down. The Belty is being pitched as a “high-end product” which usually indicates a luxury price tag, though the company aren’t sharing pricing details or a release date just yet, besides hoping that it should hit the market later this year.